Many natural health experts tell us that redness and pimples on the skin are caused by poisons in the body trying to break out, and the best way to get rid of acne for good is to do an acne detox. The kind of acne detox that really works, however, is a great deal different from the kind of detox advocated by the marketers of colon cleansers and liver flushes. You detox your system with a product you add, not with “toxins” you take away. The wrong kind of detox, like colon cleansers, can actually make skin problems worse. The wrong kind of acne detox can cause more problems that it resolves. Skin inflammation is not caused by bacteria. Skin inflammation is caused by the immune system’s attack on bacteria. “Skin detoxifiers” that irritate the skin force the skin to repair itself by removing injured skin cells—with inflammation—and releasing more oil. The reason you kill excess acne bacteria is to take away the immune system’s reason for causing pimples. It is never necessary to irradiate, heat treat, or poison acne bacteria on your skin, although there are other kinds of skin infections that may require drastic medically supervised treatment. Colon cleansers usually make the skin worse. Probiotic bacteria in the colon “train” the immune system to control bacterial infections with less inflammation. They help reduce inflammation in the skin and in the brain. Exposed Skin Care provides a product with the right probiotic bacteria for healthy skin, as part of a complete acne treatment system offered with a money-back guarantee. Acne is not really caused by toxins trying to force their way through the skin. Acne is actually caused by the immune system’s over-reaction to bacteria that normally live on the skin. The human skin is a complex ecosystem. Billions of skin cells are hosts to trillions of microorganisms, most of which belong on the skin and improve the health of the skin. Acne bacteria normally live in pores. They help the pore push excess oil out of the skin by consuming the fatty acids in sebum. Fat like the fat in sebum is not soluble in water and cannot be rinsed off the skin with water. Acne bacteria, however, convert waxy, oily sebum into some of the same kinds of fatty acids you can find in flaxseed oil and fish oil, and make propanoic acid as a byproduct. (The making of propanoic acid gives acne bacteria their scientific name, Propionibacterium acnes.) Thanks to acne bacteria, the thick and heavy sebum the skin makes to lubricate itself is transformed into smaller fatty acids and mild propanoic acid, which are water-soluble. For uncounted centuries before the invention of skin cleansers, bacteria made keeping the skin clean possible. Acne breaks out when acne bacteria get trapped in the bottom of a pore. Every skin pore also provides a passage to the surface of the skin for dead skin cells. Sometimes these skin cells clump together. When they get stuck in the pore, the acne bacteria beneath them run out of food and go dormant. As they start to go dormant, they also release chemicals that the immune system uses as a homing signal to release inflammatory chemicals. These chemicals destroy some of the bacteria, but the also sensitize the skin cells around them to immune destruction. Enough healthy skin dies that the pore opens up, after it has become red and inflamed. You could “detox” your skin and get rid of acne bacteria, but the immune system can cause pimples to form even when there are no bacteria at all on the skin. You know this is true if you have ever eaten something that made you break out, or put some cleanser or chemical on your skin that made you break out. In fact, efforts to kill all the bacteria on the skin usually cause more harm than good. Chemicals like alcohol can kill bacteria if they are applied in a sufficiently strong concentration. For alcohol, it takes a 46% (92-proof) solution to kill bacteria on contact. Much lower concentrations of alcohol, however, can kill skin cells. These dead skin cells can clog pores. The immune system has to release inflammation to get rid of dead skin, and clogged pores become pimples. An acne detox of the skin is never a good idea. But what about detoxing the colon? The human colon is another organ that is an ecosystem. Trillions of bacteria, usually about 1/3 of the content of the intestines, live in a healthy body. Without these bacteria, the stool is hard and bowel movement is difficult. A few of these bacteria cause disease, but trillions more compete with harmful bacteria for food, water, and space on the lining of the colon, so we seldom experience infections of the colon. When we do, the colon usually finds ways to empty itself so the harmful bacteria are simply flushed away. Some symbiotic, or helpful, bacteria make vitamins. Some symbiotic bacteria make essential fatty acids, especially propanoic acid, which fights colon cancer. And some symbiotic bacteria, a group of bacteria we also know as probiotic bacteria, both fight disease-causing bacteria and train the immune system. Healthy, helpful bacteria such as Lactobacillus acidophilus live in the villi. The immune system naturally tries to destroy them with inflammation. But when the immune system “learns” that these bacteria don’t have to be destroyed for the lining of the colon to stay intact, it makes fewer inflammatory chemicals all over the body. 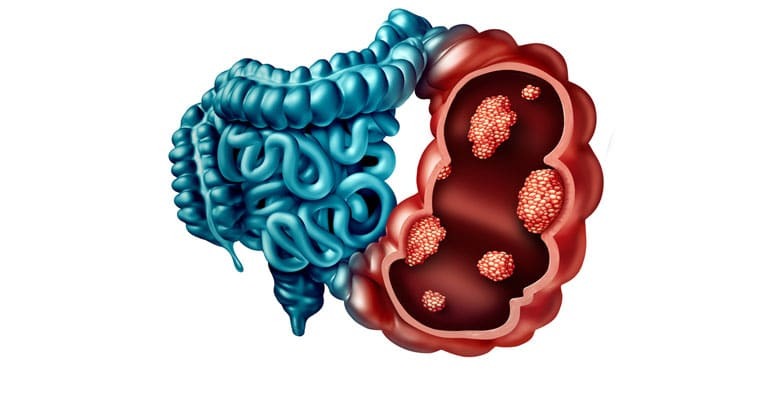 Healthy bacteria in the colon reduce inflammation in the skin and brain. Making sure you have probiotic bacteria in your colon keeps the immune system itself from causing toxic reactions. And the most severe toxic reactions in the body are almost always caused by the immune system itself. Stopping inflammation in your skin, therefore, is not something you do with colon cleansers or antiseptics. The best way to stop inflammation in your skin is to be kind to the friendly bacteria in your colon. Eat yogurt every day (either dairy or soy is fine), or take probiotic supplements. Limit your use of colon cleansers for times you are constipated. You don’t want to flush any more helpful bacteria into the toilet than you have to. And limit your use of skin cleansers for times you have visible inflammation of the skin. Remember that what you are doing for your skin is taking away the reason your immune system has to keep your pores inflamed. You are not killing bacteria that actually causing the inflammation. Probiotic support is much more helpful for your skin than any kind of “acne detox.” You can get the probiotics you need for your skin from Exposed Skin Care, along with products that keep your skin clean, clear, and vibrant. This is fantastic information. Thank you. I'm confused, I've read that dairy may be the cause of my hormonal acne around my jawline and chin...so ...how can I eat more dairy to help? Yeah, but Pro-biotic yogurts though, not Rolo or Muller Corner! Lol! My nutritionist advised a liver detox in conjunction with a colon cleanse and taking probiotics. Perhaps I'm on the right track! Two 20-day detox cycles didn't clear the acne, so I guess I'll try for a third and see how that goes. Hmm, probiotics don't always equal clear skin.... I had parasites that were causing my acne breakouts and had to do a galbladder flush and a month of herbal pills to kill the parasites and flush them out. ALSO dairy is a HUGE no for acne.